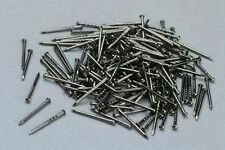 PIKO H0 55298 Track Screws Approx. 400 Pcs. PIKO H0 55299 Track Nails Approx. 400 Pcs. IDEAL FOR USE ON PLYWOOD OR SIMILAR BASEBOARDS WHERE NAILS ARE DIFFICULT TO USE.